Even as twitter is roasting the PM-assassination-plot theory and its proponents, it is important to note that the way this narrative is being built is exactly how state propaganda works. At first, the state turns a blind eye to allegations leveled against its agents. When the heat begins to rise, a campaign is unleashed to reverse the narrative. Opponents of the regime are hunted, barely-provable evidence is produced from thin air and is labeled incriminating. The state and its agencies do not wait for public acceptance of the narrative which is swiftly moving from one conclusion to the next. The complainants are eventually branded as enemies of the state, making it easy for the law to swoop down on them and for the state to manufacture public disapproval. Sambhaji Bhide and Milind Ekbote, leaders of radical Hindutva outfits, are accused of instigating large-scale violence during a Dalit congregation in Pune’s Bhima-Koregaon on January 1 and 2 this year. The violence killed one man, besides injuring several others. While Ekbote was arrested but is now out on bail, Bhide continues to be unreachable for the fabled long arm of the law. Meanwhile, an entire bunch of activists dedicated to fighting battles for Dalits and tribals is arrested. A letter is produced, purportedly recovered from the laptop of the one of the accused. The prosecution lawyer reads out the letter in court after which, only the ruling party’s spokespersons get access to it. They read it out on TV and publish excerpts on social media. The letter talks about Maoists and openly mentions information about their plans, meetings, funding as well as criminal projects. Those arrested are also promptly labeled Maoists. Even before you can come to terms with that, the narrative changes once again. The alleged Maoists, it is explained, could have been out to kill the prime minister! Boom, everything changes. Because the narrative is moving very fast, it is hard for people to pause and reflect. Questions fade into oblivion and propaganda takes over. FIR in January, raids in April, arrests in June – None of the five arrested so far were named in the original FIR, lodged in January 2018. Firstly, Police is yet to explain what led to the probe zeroing down on them. Secondly, what explains the three-month delay in the raids and then again the two-month delay in arrests? The mysterious letters – The only ‘incriminating’ evidence that the police and prosecution team have furnished so far are two letters which they claim are Maoist communication. While the contents of the letters have been made public, police is yet to reveal even details like what has been done to establish their authenticity? Are unauthenticated letters incriminating enough to allow police to make arrests? Flimsy content – The contents of these letters coupled with the manner in which they are being bandied about have created an air of incredulity about them. Does one expect underground organisations to be so casual about using open letters and entirely un-coded language to talk about things like funds, weapons, meetings, strategy and a plot as dark as assassination of the prime minister? Access of BJP leaders to letters – BJP spokesperson Sambit Patra had been able to access the first of these letters on just the day after the arrests were made. Waving the letter during his press conference, he arrived at convenient political conclusions, making wild allegations. Even as hearings on the case were going on, Patra had given his and his party’s judgment. If this doesn’t smack of conspiracy, what does? Swift transition of the narrative to the Modi assassination plot – The genesis of the entire episode has now receded to the background. The violence in Bhima-Koregaon is not being talked about now. 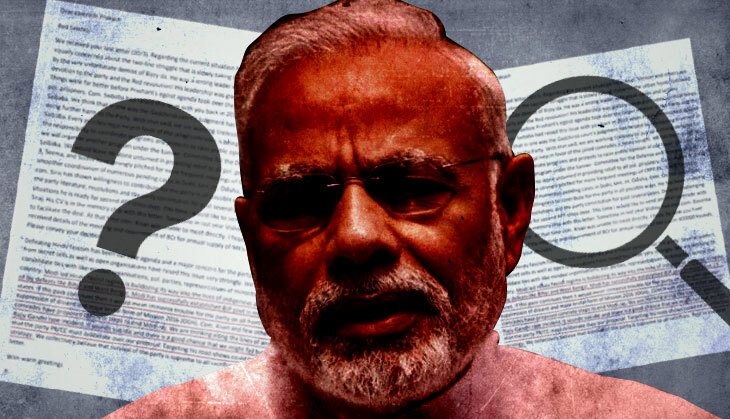 The focus of discourse is a purported plot to kill Prime Minister Narendra Modi, the objective being to help his government and his party gain public sympathy. Why are no questions being asked about this strange course the police probe has taken?